Of krijg het voor 4000 Kobo Super Points! But when a hunted woman takes shelter in his arms, this gentle giant swears he'll do more than heal her battered spirit—he'll defend her with his life. K9 Officer Otto Gunnersen always had a soft spot for anyone in need. As Monroe's very own Dr. Doolittle, he dedicates himself to rehabilitating the injured souls that cross his path—but for all his big heart, he's never been in love. I always grab Katie 's books when I find one. This works about police and K9 Rescue. It is hard to read this story. I had to walk away and then come back to read again. Alice is trying to get away from her brother Aaron. He and his partners in crime want to make her marry so he can get into their family. She saw a bomb and fled. Otto is in the police. He sees her and falls for her. She is now Sarah. Aaron finds her and Otto saves her. This is a good story. There is a lot of danger. This is a different trouble. You will have to read this book to get to the end. Check out this book! Please choose to read this book! Don't let this book get away from you! Enjoy! I thought that this book was very well done. 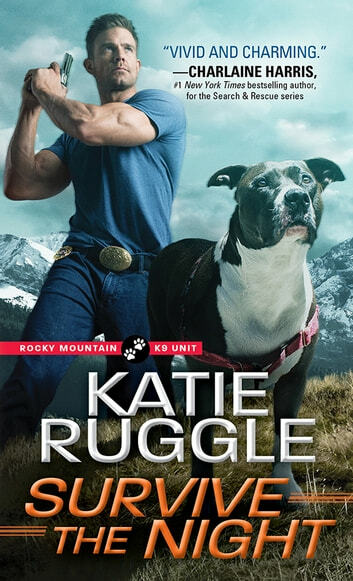 This is the third book in the Rocky Mountain K9 Unit series and I do believe that it would work best for reader that have read the preceding novels since events from earlier books do come into play in this one. This book had a lot of action and I found that I didn't want to stop reading once I started. This book was just a lot of fun to read. This book features Otto and Sarah. Sarah has lived a life controlled by others. She is given no choices and is physically abused often. When she gets a chance to start a new life, she jumps at the chance and ends up rooming with Jules and Grace from previous books. Otto is an officer with the local police force. He is quiet and extremely kind. He has a soft spot for animals and is known to take in those needing a home. I liked Otto and Sarah together and thought that they had a lot in common. They are instantly attracted to each other but they don't seem quite sure how to deal with it at the start. Otto seems to be what Sarah needs and is there when needed. He has a quiet calmness that Sarah seems to need. When Sarah needs to be rescued, Otto is there to help. They really seemed to compliment each other very well. The books in this series have all had a lot of action but I think that this one takes things to a whole new level. There are several very exciting scenes that really had me nervous for the characters. I liked that the characters from the prior books all play key roles in this book and get in on the action as well. The animals in this book were great. Any book that can work a few animals into the story get a few bonus points from me and this one had quite the menagerie playing the part. I only had a couple of very minor complaints. I thought that Sarah recovered from the years of abuse a lot quicker than I would have thought possible. I also would have liked to see a bit more regarding Otto's history. There is a quick mention of his past that really made me want more. I would have liked to see them both work through their issues from the past together. I would recommend this book to others. This was a really exciting book that was a whole lot of fun to read. I can't wait to read more of this wonderful series! I received an advance reader edition of this book from Sourcebooks Casablanca via Edelweiss. More drama, more explosions, more love….just more! Otto and Sarah are very alike, they are both quiet, patient, observers, who are happy in their own company…..until they meet and fall for each other. Both have heart breaking pasts, childhoods you wouldn’t wish on anyone, but both have survived and both are stronger because of it. Which is good because they will need every bit of that strength, and the strength they give each other, to survive everything and everyone Aaron throws at them. The slightly awkward, unsure interactions between Sarah and Otto in the beginning are so sweet and endearing, theirs is a quiet, gentle love. Unlike that of Grace and Hugh in the previous book who’s love is firey, loud and passionate, there is no less passion, but it is a private, all consuming love which also includes the numerous animals Otto has opened his home to. The bond formed between Sarah and Xena is the bond of two broken souls who can sense the others pain as well as their strength and brings a tear to your eye. Whilst Sarah and Otto’s love is the quietest of the three couples, this book is not. By contrast this is the loudest, most explosive, most confrontational and hostile of the series. The drama and terror is only increased when they realise they have a traitor within the team, striking a personal blow at the worst possible time. With multiple attacks on multiple fronts they have to split up, will they all survive? Or will the evil finally defeat them to take a win? Will Monroe be destroyed? This is a gripping series with a fantastic cast and more twists than a corkscrew – read it now! This series is seriously good. There is a lot going on and all coming out of left field. Katie’s books will always have you on edge even though you know the good guys win.